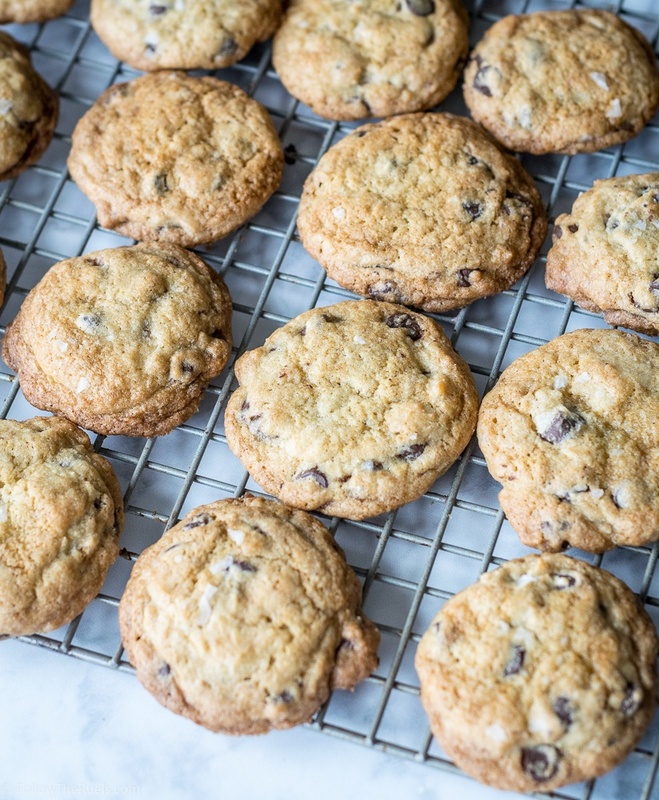 There are a whole lot of chocolate chip cookie recipe out there. I mean, I have a whole Pinterest board dedicated to chocolate chip cookies. Despite the vast quantity of recipes, they are pretty much all the same, maybe just a few tweaks in the amount of ingredients or the quality of the chocolate. I have been on a quest to find the best chocolate chip cookies for a while. Actually, don't be surprised if you see a whole challenge in the future where I pit one recipe against the other for total chocolate chip cookie supremacy (hence the chocolate chip cookie Pinterest board). But I recently whipped up a batch of cookies using a very familiar and classic chocolate chip cookie recipe as my guide. Of course, I made a few tweaks to it, because that's what I do, and the cookies turned out incredible. I didn't use any fancy chocolate or extremely expensive or exotic ingredients. My special ingredients are two things you might already have in your pantry: sea salt and coffee extract. Other than that, my fancy shmancy chocolate chips cookies are basically the Nestle Tollhouse cookie recipe. While I am known to change things up a bit and make a recipe my own, I did follow strict instructions to freeze my dough. I let the dough chill for an hour before I scooped it onto the baking sheet, then I chilled it again for another 15 to 30 minutes. Not only did this improve the shape of the cookies (they didn't spread as much) but the flavor was better, too. The resulting cookie was crispy around the edges and soft in the middle, just how I like them. If you like really soft slightly gooey cookies, then I would recommend baking then just a few minutes less so that the center are just a tad under baked but the edges still have some structure to them. I couldn't stop eating these cookies. They tasted like a better version of the chocolate chip cookies I would eat as a kid. They were sweet and rich. The chocolate flavor was accentuated by the coffee extract. But the sea salt is what really put these cookies over the top. I will never again make a chocolate chip cookie without a sprinkle of sea salt. It just takes them to a whole new level. Since I couldn't stop eating them, I got the out of my house and brought them into my office where my coworkers gobbled them up as well. Even though at that point they were a couple days old, everyone raved about them. I wanted to tell them they were this very complicated recipe using expensive gourmet chocolate, because they would have totally believed it. Instead I told them the truth: it's pretty much just a Nestle Tollhouse chocolate chip cookie. Can't beat a classic! In a separate bowl, or bowl of a stand mixer, beat the butter and sugars until light and fluffy, about 1 minute. Then add in the eggs and extract and mix until combined. Pour in the flour mixture in two stages. Add in first half and mix until combined. Then add in second half and just barely mix in. There should still be a lot of flour that hasn’t been incorporated. Now add the chocolate chips and mix until flour is just barely combined. Dump the dough out onto a sheet of plastic wrap, flatten into a disk, then wrap and chill for 1 hour. Once dough has chilled, form into 1 tbsp balls of our dough. Place balls on the baking sheet and sprinkle the tops with sea salt. Chill the dough again for another 15 minutes. Meanwhile, preheat the oven to 350 degrees. Remove the dough balls from the freezer and make sure they are at least 1 to 2 inches apart. Bake for 8 to 10 minutes until the edges are browned. Remove from the baking sheet while they are still warm from the oven and cool on a wire rack.